With the removal of the Queen mother, many new honours were placed upon the Cardinal’s head. He had the title of Eminence bestowed by Urban VIII, coadjutor of the Abbot of Cluny which increased his holdings and the opportunity to further the cause of the counter Reformation, a personal dream of his. In September 1631, the King created him Duc de Richelieu and a peer of France which allowed him a seat in Parliament. From that point on he was known as “Cardinal-Duc”. He became Governor of Brittany while his friends took the fortified towns of the north. Letters of Venetian nobility were given which he might pass to any of his family members. He had become nearly as powerful as the King himself. One of the scandals of Richelieu’s time in power surrounded his reaction to the Marillac brothers, whom Richelieu regarded as enemies of the State. They came from a distinguished and “devot” (ultra Catholic) family. Michel, the elder, was a man of many accomplishments and had sat on the King’s counsel. He was responsible for creating the “Code Michaud” which reformed legislation and was adopted by the Estates General in 1614 and the Assemblies of Notables in 1617-26. He was also Keeper of the Seals until he was implicated in Marie de Medici’s plots to overthrow the King. After the Day of the Dupes, he was arrested and died in prison shortly after the death of his brother, Louis. Louis had been made Marshall of the army that fought in the War of the Mantuan Succession. Here we see Richelieu’s extreme in matters of state as he forced the trial of Louis Marillac under charges of “peculation and oppression” when governor of Verdun. Parliament refused to bring Marillac to trial for committing “sins that were common to his time and trade”. The trial dragged on. No one wanted to execute a good and loyal soldier. Eventually, Richelieu formed his own commission which, against public outcry, condemned the soldier to death. He was beheaded at the Place de Greves on May 2, 1632. His epitaph read “….this illustrious victim of a powerful and vindictive minister”. His wife, Catherine de Medici, died of grief a few months later. Twelve years later, the Parliament of Paris acquitted Louis Marillac of the crimes which he suffered for. The other illustrious head that would become victim of “raison d’etat” was that of Henri de Montmorency. His story exemplifies the struggle between nobility and the state. Henri was born into a very old and very noble family, a family descended in an unbroken line from the time of the first King of the Franks, Clovis. As a child, he was the godson of Henri IV and the darling of the court. 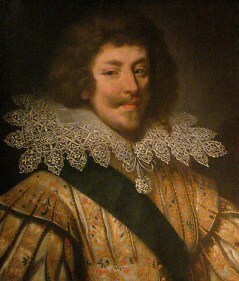 His was a bright and affable personality, certainly the opposite of Louis XIII and 6 years older. Never the less, at seventeen, he was made Grand Admiral of France. His list of military services under the King was impressive. He was present at the sieges of Montauban and Montpellier, led the navy in relieving the King during the 1625 civil war, defeated the Protestants against Henri de Rohan in Languedoc, fought the Spanish in Piedmont, Italy and raised the siege of Casale. For this, he was given the title of Marshall of France. He was also Governor of Languedoc, a province with the ancient right of autonomy over taxes and a Protestant stronghold. Richelieu had issued a central edict for taxation which the people felt was a violation of their rights and further stirred hatred towards him. As time passed with no resolution to the problem, the people began to realize that they were being stalled by Richelieu and that the matter would be ended with a swift and terrible reprisal on his part. At this, Montmorency read out a manifesto which Gaston had written, calling the people to rise, not against the King but against the tyrant who the cause of so much suffering. 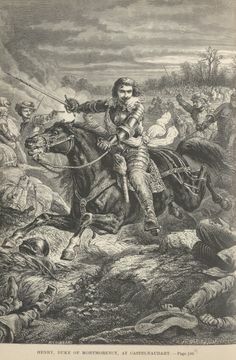 The summer of 1632 saw Montmorency sign a declaration of support for the nobles of Languedoc but before he had time to prepare to meet the King’s army, Gaston rode in with an ill-disciplined and unpaid army. In the meanwhile, Richelieu had once again taken swift action and sent two armies to hem Languedoc in from the east and west. While the other nobles of that province refused to take orders from Montmorency, the Cardinal’s troops grew ever closer to Castlenaudry until in despair, Montmorency rode to go out to face them. Gaston’s troops fell apart hearing of the approach and were quickly routed. While many of the mercenaries fled, the good soldiers threw themselves with Montmorency, into battle, some of them losing their lives. Among them, Antoine de Bourbon, a son of Henri IV, therefore half-brother of the King. The Duke had gone to Antoine’s support as the men took flight in front of the King’s troops. The way was commanded by the Royal Musketeers who shot his horse out from under him. He was wounded and captured. Gaston was the King’s brother, therefore he could not be punished in the same way that an ordinary subject would have been. He was spoiled and petulant, demanding money, the return of the Queen and amnesty for Montmorency. The Cardinal knew better than to trust Gaston and sent him in exile to Touraine with his nobles. Montmorency however, did not fare as well. After two months being imprisoned at castle Lectoure, he was brought to Toulouse to be tried for treason. Richelieu’s policy was to make an example of the high for the good of the state which must be united under the King. While all the country and the nobility pleaded “miseracorde” for the great soldier, Richelieu though moved, was kept to his course by Pere Joseph, his trusted advisor. No one must again ever think of uniting under Gaston in rebellion again. On October 30, 1632, the same day as his trial, Henri, Duc de Montmorency was beheaded, to the great sorrow and anguish of France. In his will, he left a beautiful St. Sebastian painting to the Cardinal. Hearing the news, Gaston once more took flight across France to Brussels. Would the swift and terrible justice of the Cardinal be enough to check him? This entry was posted in Cardinal Richelieu, France, French History, Louis XIII and tagged Cardinal Richelieu, France, French History, Gaston d'Oreans, Louis XIII, musketeers by Shamwest. Bookmark the permalink.